The deets: Piperlime dress (sold out); Ray-Ban sunnies; earrings c/o Giando Massi; necklace c/o Lisa Leonard Designs; Lancome "Wannabe" lipstick; ShoeMint heels (sold out); Fornash bangle; ASOS spike bracelet; Michael Kors watch; Steve Madden bag. Photos c/o LindsCon. Here we have another work look documented for your viewing (or glazing over) pleasure. I went a little matchy-matchy-cray-cray but no regrets here. I maaaaybe miiight have been pushing the rules a little with this number (I didn't realize how short it looked until checking out these photos). The lucky people standing below me on the metro escalators might have gotten a little more than they paid for that day but I came out of the office unscathed so no harm done! Also - let's hear it for JMU making it to the NCAA tournament this year - HEEEEY! Go Dukes! Also - don't forget to enter the Lisa Leonard giveaway happening this week, enter below. Currently Coveting is also on Twitter, FB, Instagram, Bloglovin, and Pinterest. Cute dress and your shoes are pretty cool! That dress was made for you! So pretty!!! I love the combo of navy and beige. 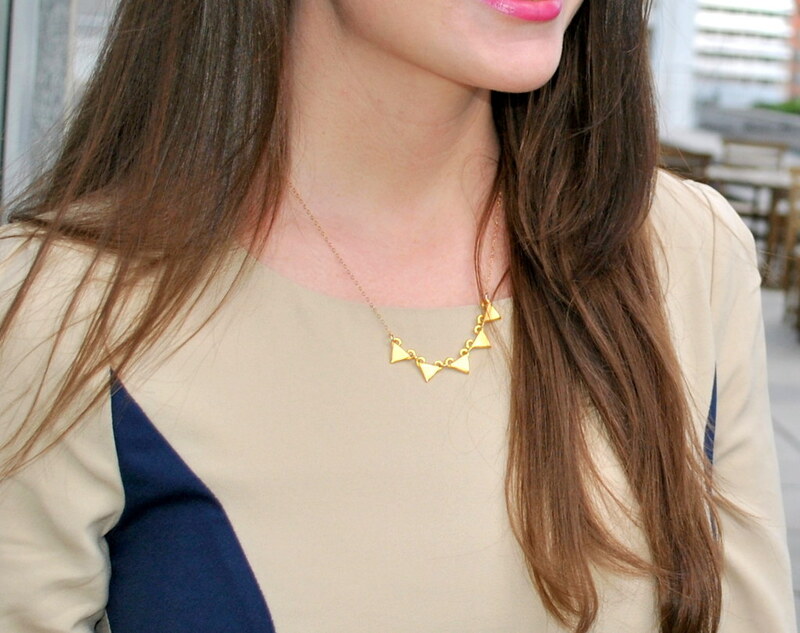 The gold necklace is the perfect touch–you look gorgeous! Love this dress on you- the fit and color-block cut-outs are so flattering! Love the dress Erin - you look adorable! FABulous dress! And those heels!! You look awesome. Have a great weekend! Love the dress, it looks great on you! Cute shoes too! Love your dress and shoes. You look adorable. 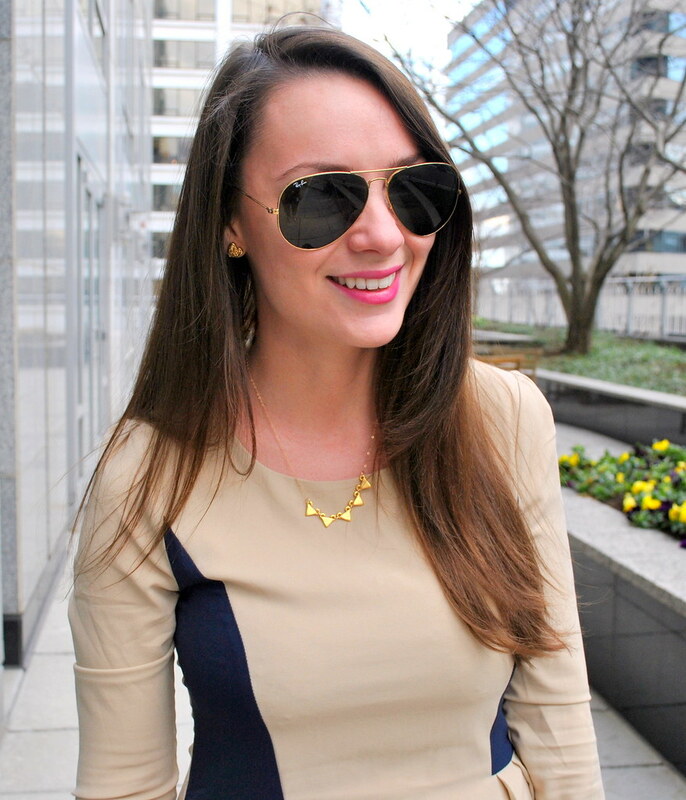 This is absolutely a polished work-perfect & beyond outfit....navy & cream is one great combo!! Glad to be following you via IG!! Super cute dress! love the look! Comments make my whole day, so go on and make it. I'm Erin. New(ish) mama to my baby girl, married to my college sweetheart, lucky in love and rich in friendship, addicted to documenting the sweet bits of life. This is my living love journal. All images © Currently Coveting 2011-.